The big draw for cruise lines these days is "the bigger the better." Such is certainly the case with Norwegian Cruise Line's newest ship, the Norwegian Bliss. Fresh off its month of inaugural sailings and festivities, the Bliss is currently making its first commercial sailings ever to Alaska followed by a stint in Mexico, then a winter season sailing in the Caribbean. With capacity at 4,004 passengers, the Bliss extends 1,094ft and has a gross registered tonnage of 168,028 tons. The 20 decks of this ship feature a highly view-centric cabin arrangement; more than 80% of the rooms have seaviews, while 40% of them have their own balconies. There is no shortage of dining and drinking venues on board with 16 bars/lounges/clubs and a mix of 13 specialty dining options and 5 main dining attractions situated throughout the ship. But the most impressive, and perhaps outlandish, feature of this behemoth of a ship? The two-story go-kart track on the ship's top deck. You heard that right - you can speed around at up to 45mph on a track that's better than those you see at family fun centers in suburbia. Needless to say, the Norwegian Bliss is a testament to cruise lines' ability to pack as many things onto one ship as possible. It is indeed a floating playland, a monolithic resort taking on the world's oceans, perhaps testing to see how far our capacity for gluttony at sea can go. When you first get a look at it right before you're about to board, you get that feeling of excitement you haven't had since Christmas when you were 10 years old. Last month, Cruises & Beyond had the privilege to attend an inaugural preview of the Norwegian Bliss. NCL gave travel agents and consultants alike an opportunity to experience their newest ship shortly before her first sailing to Alaska amidst a two night foray into international waters from Los Angeles. With such little time, it was nearly impossible to check out every corner of the ship, but we saw enough to give you our initial impressions of this unique vessel. Due to the impressive marketing push for the Bliss by NCL, it was hard not to have a positive pre-conceived notion of the new ship. Social media takeovers and excellent footage of the ship sailing from its origin point at the Meyer Werft Shipyard in Papenburg, Germany to the United States produced an awesome inside look for all NCL fans. Experiencing the ship in person did not disappoint. Walking up to the ship feels like you're walking towards one of the largest skyscrapers on Earth. It is massive and the amount of balconies outnumber many we have seen on most ships in service, aside from Royal Caribbean's oasis class ships. We were fortunate to be assigned a balcony cabin aboard this inaugural sailing and absolutely loved the simple and elegant design of the cabin. Clean and functional, the Bliss' balcony cabins offer enough space to lounge around and enjoy the wonderful views that come with sailing the high seas. Of course, the standard balcony is no match for the Bliss' exclusive cabins tucked away at the top of the bow and on decks facing the aft. These exclusive cabins, known as Haven Suites, offer luxury suites and family villas and exclusive access to shared spaces for Haven guests only. If you're looking to splurge on your cruise, you'll have access to the gorgeous sunroom with its own pool and a retractable roof and the Horizon Lounge (with the best view on the ship through a large slanted glass window that makes the room feel endless). Staying in The Haven also gives you priority when reserving entertainment and excursions, access to The Haven Restaurant and exclusive cocktail parties, and your own 24-hour butler. 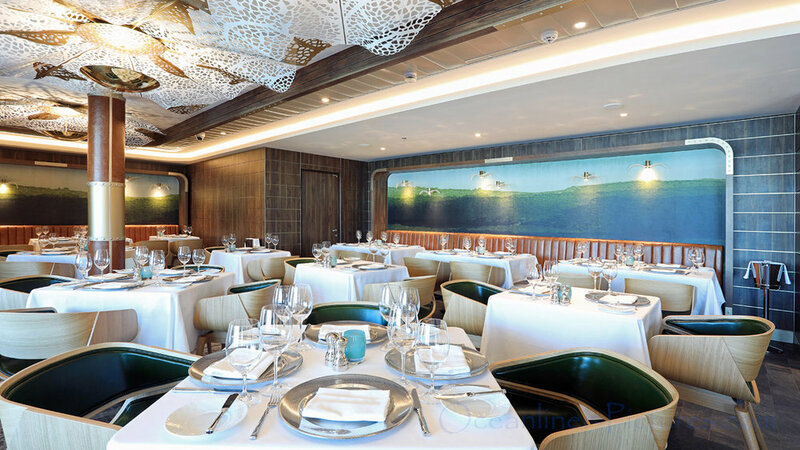 While NCL arranged for us to dine at only one of their specialty restaurants aboard this inaugural preview, we had a chance to take a peak at some of the 13 specialty dining options available on the ship. There is literally a cuisine for everyone. From delectable fusion to Texas-style barbecue, the Norwegian Bliss cannot possibly disappoint your pallet. A 7-day cruise might not even be enough for you to try all of their sumptuous dining options! Despite not being able to try all of these specialty restaurants, Cruises & Beyond still had the privilege of dining at the Manhattan Room, one of the Bliss' main dining venues, and Ocean Blue, one of the specialty seafood restaurants. The Manhattan Room serves what you expect from an ocean liner - a blend of modern and classic dishes meant to satisfy the North American palate. But what most impressed us of this main dining venue was the sophisticated sense of style emanating from it's overall design. High ceilings, large windows with oceanview vistas and modern touches give a feeling that you're dining at Maestro's in New York City. Our time spent in Ocean Blue gave us a quick taste of NCL's ability to produce a more specialized dining experience, with a more premium selection of food and premium service. While the service itself wasn't exactly Crystal Cruises status (we don't blame them as they were probably still working out some training kinks - and this isn't really a fair comparison), the food and the coffee was very good! Not to mention the pleasure of having the company of NCL's very own Rex Goodman, who shared many hilarious and touching stories of his time growing up and his experiences working for one of the largest cruise lines. The main attraction for food during this preview was the Garden Cafe on the Bliss' 16th deck. One of the largest buffets that we've seen on board a cruise ship, the Garden Cafe goes above and beyond with a variety of cuisine offerings. 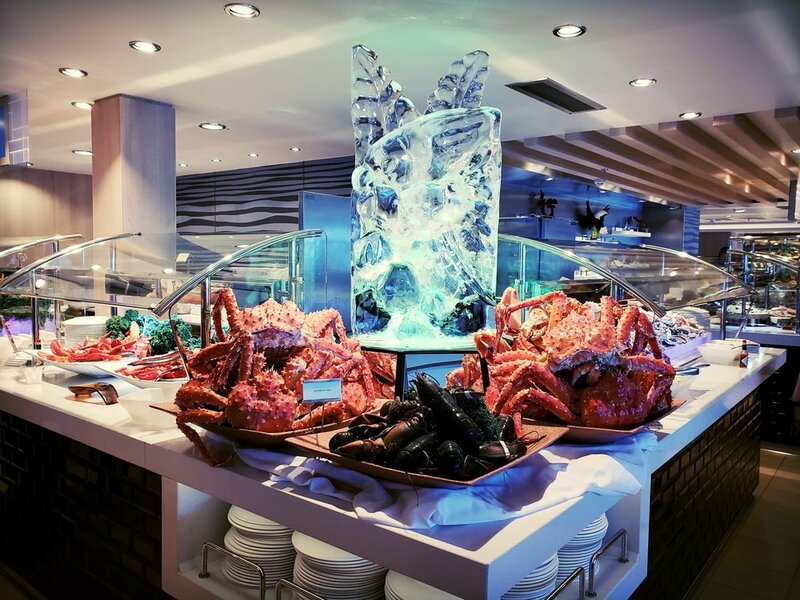 The sheer size of the buffet itself will make any food enthusiast faint. It didn't help that NCL spoiled us with an extravagant seafood buffet during our second day on board. Massive king crabs, juicy lobster, sushi, grilled jumbo shrimp - you name it. The Bliss simply had everything! We left with our stomachs full and satisfied, to say the least. The big highlight of the Norwegian Bliss is its entertainment offerings. Right from the get go, as you first enter the sun deck, you're immediately overwhelmed by the activities going on around you. Swimming pools, countless hot tubs, multiple water slides, go-karts and replica beach clubs - it's like this ship was designed to be a one-stop shop for Caribbean vacation goers. You almost wonder why the Bliss' first stop is Alaska! 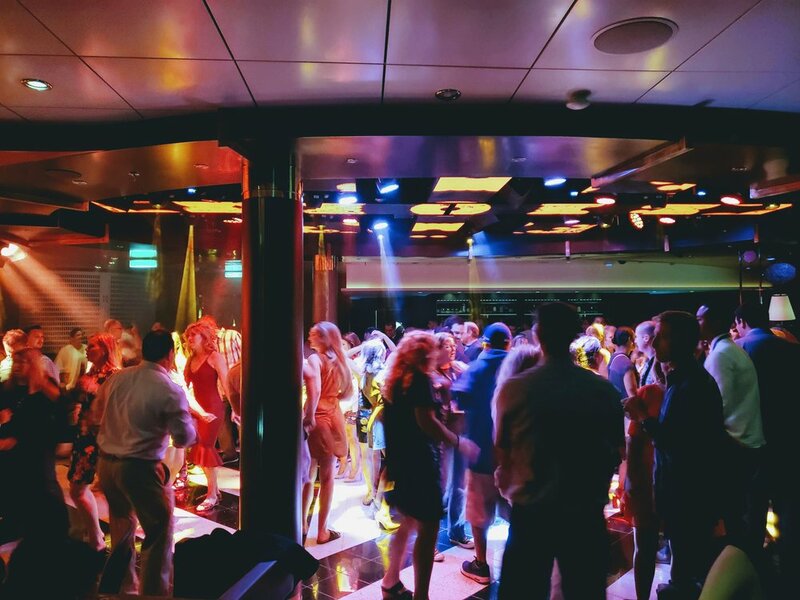 Cruise lines aren't usually known for their late night activities aside from their main evening performances, of which the Bliss offers plenty (Jersey Boys, ¡Havana!, and Happy Hour Prohibition - The Musical). The Bliss upends this stereotype by offering a couple of late-night venues in their Cavern Club and Social Comedy and Nighclub. The Cavern Club hosts a Beatles cover band while the Social Comedy and Nightclub begins the evening with hilarious comedy shows and turns into a dance club late into the evening. The music is a bit cheesy, but the vibes are still fun! From its many family friendly venues, to it's adult-only havens and exclusive suites and spaces, the Norwegian Bliss attempts to cater to all types of cruisers. While on paper this is what it accomplishes, the Bliss just simply isn't for everyone. A lot of cruisers like a consistent theme across the ship, whether it be an exlusive ambiance throughout the entire ship or the fun nature of family cruises like Disney Cruise Lines offers. The Bliss is an almagation of both, offering its customers different tiers of service. However, this doesn't detract from the fact that this ship is probably currently one of the top in-demand ships for the forseeable future. And the reason for this is because it's simply super fun! When an adult can say that they feel as excited as a kid going to Disneyland or Disneyworld for the first time, then something is being done right. The Norwegian Bliss certainly has that awe-inducing factor, igniting your inner desire to explore all the pleasures it has to offer. Thumbs up from Cruises & Beyond, and be sure to book your blissful journey with us soon!